If you are an experienced tourist or you know some locals in Xian, you won’t buy any souvenirs at the gift shop in Terracotta Warriors. 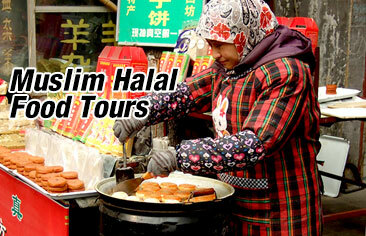 You would wait until reaching Xi’an Muslim Quarter because souvenirs sold there are of better quality at ideal prices. Xian Muslim Quarter, also called Muslim Street, is actually the collective name of several streets, including Beiyuanmen Street, North Guangji Street, Xiyangshi Street and Dapiyuan Street. In this busy district filled with visitors, all your attention will be drawn to the numerous souvenir shops, appetizing halal cuisines, antique architectural buildings as well as local Muslims with distinct exotic appearance. Back to 1000 years ago in the Western Han Dynasty, Xian was the starting point of the ancient Silk Road. Besides great wealth of goods, traders and students from Arabic countries and Persia also immigrated along the route. The area they settled down later evolved into today's Xian Muslim Quarter. How to get to Xian Muslim Quarter? If you are already standing at Xian Ancient City Wall, the answer would be causal, just follow the flow of tourists. Walk along South Street, you will reach the famed Xian Bell and Drum Tower in 15 to 20 minutes. Take the archway under Drum Tower, you will soon stand at the entrance of Xi’an Muslim Quarter. What presented in front of you will be shaded streets pave with gray flagstone. The two busiest streets in Xian Muslim Quarter form a L-shape. At the end of the first long street, you turn left. The narrower street in front of eyes is the second street. It takes about 1.5 hours to cover the two streets. But this is estimated disregarding time spent in shopping and eating. Thus, you are best suggested to wear a comfortable pair of flat shoes, ample drinking, and most important enough money to enjoy all you fancy along the way. Xian Muslim Quarter is also called Xian Muslim Food Street. This speaks a lot its power as a cuisine draw. Each individual street in Muslim Quarter is lined by restaurants and food stalls. Pork and non-halal food is prohibited in this Muslim community. Muslim visitors can stay assured while savoring the delicacies. Featured cuisines include Yang Rou Pao Mo (Mutton soup with pita breads), Rou Jia Mo (marinated shredded mutton in baked bun), halal BBQ. As you walk along the food street, you will, as many other visitors do, fascinated by food stalls making and selling Biang Biang Noodle. The master slams paste onto the table producing loud “Biang Biang” sound. The paste will be pulled and thinned into noodle as wide as belt. Cooked Biang Biang Noodle is of well chewiness due to repeated slam. Xian Muslim Quarter is a real sense alive Muslim community, not a intended one for tourists. This means, the authenticity of Muslim culture has been preserved to the great extend. In addition to daily life facilities, this community is also scattered with ten mosques, Xian Great Mosque being the oldest one. It adopts Chinese style architectural style, featuring roof tiled with glaze and phoenix statues. But the prayer hall is exclusive to Muslims. A good example of how Muslim community keep its own form in the meantime of cultural and religious blending. Xian Muslim Quarter, as the city's Muslim community, is a strong draw for either halal delicacy browsers or devout Muslims, or both! There are several ways available to plan a visit there. A light and easy day trip, or a multiple days tour deep into this city, choose as you like.